How Well Are You Managing Stress? Which of the following situations cause stress? The correct answer is all of the above. Any major change can cause stress, even good change. Changing how you react to stress and doing relaxation exercises can help. The correct answer is all of the above. Stress causes changes in the body that can make it harder for your body to fight disease. Talk to your doctor about how you can better control your body’s natural response to stress. Ongoing stress can increase your risk for heart disease, stroke, and other health problems. The correct answer is true. 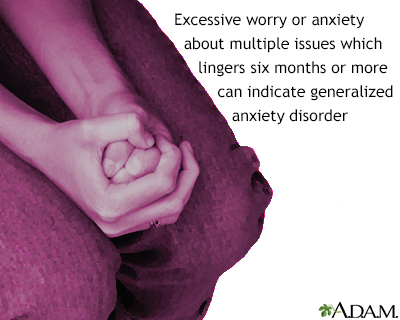 Some stress is healthy, but excessive stress can cause health problems, or make them worse. Talk to your doctor if you think some of your symptoms are related to stress. 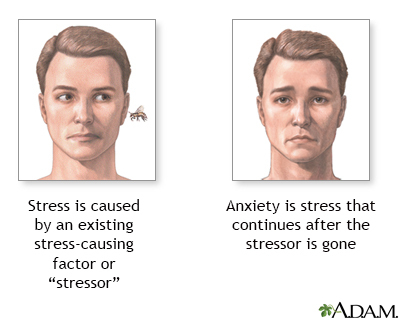 Which of the following are symptoms of stress? The correct answer is all of the above. Stress doesn’t always produce clear symptoms. Even minor symptoms, such as upset stomach, stiff neck, or hiccups can be related to stress. If you notice symptoms of stress, take time to relax every day. The correct answer is false. Children often feel stress because they can't communicate their feelings. Physical symptoms, such as stomachaches, can be a sign of stress in a child. If you are a parent, try to lower your own stress level. When you are stressed, it can cause stress in your child. Some studies show that job stress may be as bad for your health as smoking or not exercising. The correct answer is true. Stress makes it hard to concentrate, causes sleeplessness, and increases the risk for illness, back problems, accidents, and lost time from work. Think about ways to take stress out of your work life. Take time to go for a walk during lunch, or find other ways to relax during the work day. Which of the following activities can help you feel less stress? The correct answer is all of the above. Spending time with friends, going for a run, playing with your dog, or doing deep breathing can lower your stress level. Try different ways to relieve stress and see what works best for you. Over-the-counter medicines can relieve stress. The correct answer is false. Medicine can’t make stress go away, but it can help you manage stress symptoms. Pain relievers can help ease tension headaches, and antacids and laxatives help an upset stomach. A better idea is to learn healthy ways to deal with stress. If you can't manage stress on your own, talk with a therapist. Which of the following activities can help you ward off the effects of stress? The correct answer is all of the above. All of these activities improve your health and help you deal with stress. To make stress easier to handle, eat a balanced healthy diet, exercise daily, and express your feelings to friends, loved ones, a therapist, or in a journal. Which of the following help you learn to relax? The correct answer is all of the above. There are many different relaxation techniques that can help you deal with stress. Talk to your doctor about what type of relaxation therapy is right for you. Living a stressful life is unavoidable. The correct answer is false. Most people feel stress, but you can learn to manage it and even avoid it. Making healthy changes in your habits, learning to say no, setting priorities, and leading a healthful lifestyle are just a few ways you can combat stress. Talk with your health care provider about how to manage the stress in your life. Ahmed SM, Hershberger PJ, Lemkau JP. Psychosocial influences on health. In: Rakel RE, Rakel DP, eds. Textbook of Family Medicine. 9th ed. Philadelphia, PA: Elsevier; 2016:chap 3. National Institute of Mental Health website. 5 things you should know about stress. www.nimh.nih.gov/health/publications/stress/index.shtml. Accessed June 1, 2018.